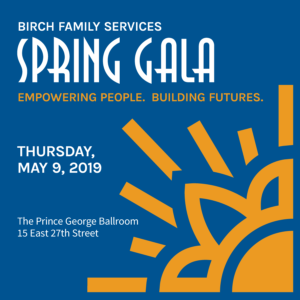 Join Birch Family Services on Thursday, May 9, 2019, at the Prince George Ballroom in New York City as we celebrate our achievements and help build a fulfilling future for the individuals we support at our annual Spring Gala. During the evening, we will recognize individuals and organizations whose vision, leadership, and endeavors are central to our Gala focus — Empowering People. Building Futures. — and ensure that we are able to continue to support the individuals seeking our assistance today, tomorrow, and for many years to come. At Birch Family Services, we empower individuals with autism and developmental disabilities to lead fulfilling lives. Through our education and community programs, we help children, adolescents and adults to learn, live more independently, obtain competitive employment, and become integral members of their communities. This is accomplished with the support of those who share our vision to help individuals with different abilities achieve their dreams. Each day, Birch Family Services supports more than 2,000 individuals and their families throughout New York City. Each year, more and more families turn to us for assistance. With your tax-deductible contribution, you can have a lasting impact on their lives.